We revised our list of best scuba diving gear packages in 2019. 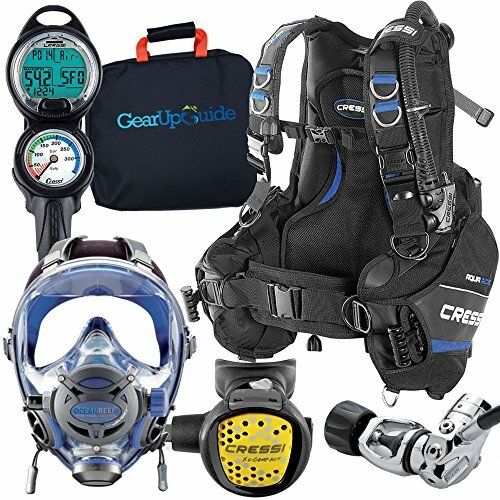 The Cressi Sub Start Equipment for Scuba Diving is the perfect start-up scuba gear package for newbies. Its BCD, the Cressi Start BC, has an ultra durable frame and construction that can withstand simple and minor mishandling by a novice diver. A perfect example of this newbie skill is the sudden and total inflation of the BCD after the dive as they always want maximum buoyancy at surface where the BCD’s thick bladder can easily resist this sudden increase in pressure and excess pressure (in cases of putting to much air) will just automatically exit in one of the three exhaust valves. When going underwater, newbies will find it easy descending by pulling one of the two dump valves instead of the traditional pressing of the deflator button while pointing up to the surface. Newbies will also appreciate its built-in octopus and submersible pressure gauge holder where you can neatly tuck in your low and high pressure hoses instead of dangling around that can possibly cause entanglement. 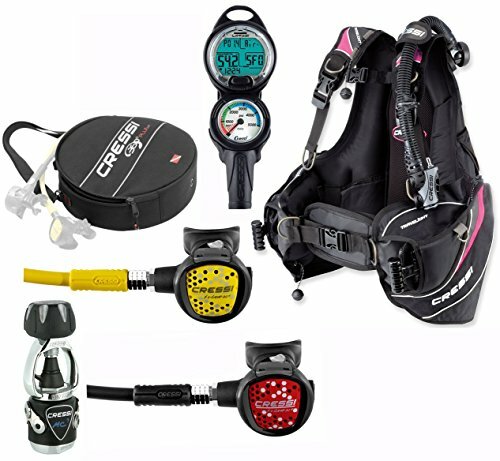 With regards to the regulator set, this scuba gear package consist of the Cressi AC2 XS2 as its the 1st and 2nd stage regulator, Cressi XS Octopus as the alternate air source and the Cressi Mini Two Gauge Analog Console as the submersible Pressure Gauge. It’s 1st stage has a yoke valve that utilizes the non-balanced downstream system that gives high performance breathing while having a smooth breath at the 2nd stage courtesy from its adjusted intermediate pressure. The alternate air source features a comfortable easy grip mouthpiece and an easy to purge button that will come in handy in case your buddy is low on air or out of air. The submersible pressure gauge is color coded for easy air pressure reading. The blue color indicates you have a fresh supply of air down to 2,000psi (138 bars) while the green color indicates you are somewhere in between the pressure range of 3,000 to 1,000 psi (205 - 70 bars) and red, of course as we all know, indicates you are low on air. Further, the mini console has a built-in depth gauge that can read to a maximum depth of 230 feet (70 meters). 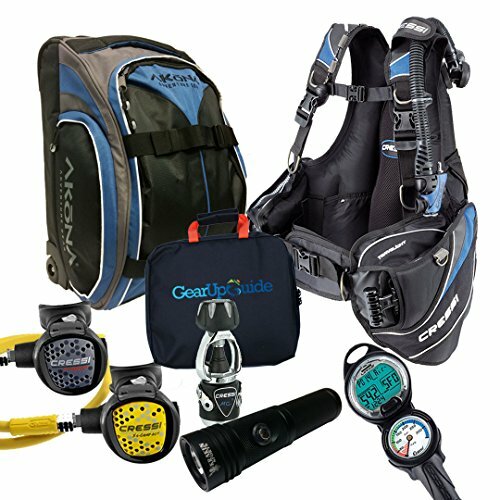 Going back to the claim that this scuba gear package is recommended for newbies, you have to remember that this is start-up gear and it is cheaper compared to other gear sets. But despite being less expensive, functionality and durability are not compromise as some who have bought this package have used it for years without any problem. Thinking on the long run, most probably as you go along your diving career, you will need to upgrade your equipment and may opt to use more advanced and sophisticated gear. So, having a start-up equipment would not hurt your pocket as you upgrade and purchase high-end and multiple use scuba equipment. Note: In case you already have a gear bag, you have the option to change the Akona Adventure Gear Roller Suitcase in to an . 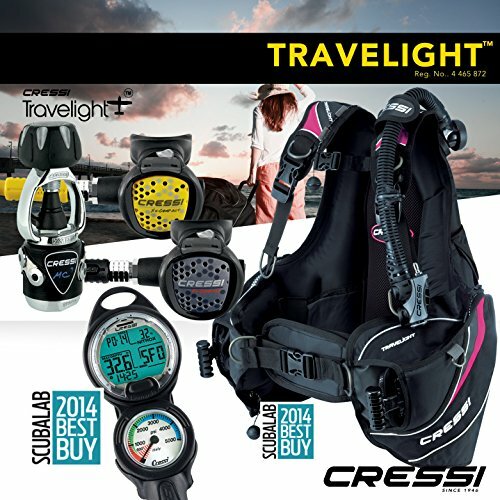 The Cressi Trevelight 15 LBS Scuba Diving Package is one of the few scuba gear packages that includes a console integrated dive computer and a travelling bag. 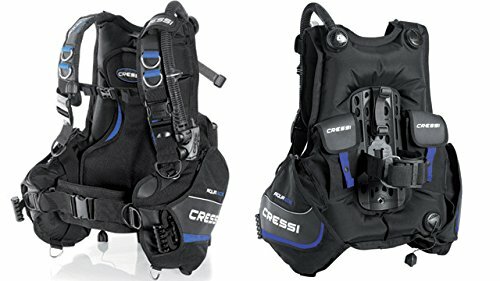 This package consist of the Cressi Travelight BCD which has a fully padded backpack for a soft and comfortable fit, 9 relief valves, 8 D-rings made of alloy for other equipment and accessory attachment. Using Cressi’s “Lock Aid” mechanism, this BCD has a weight integrated system located on the side pouch which can carry up to 20 pounds (9 kilograms) of lead weight. Just in case you have a large body built and need more weights, you can use the back pockets which can accommodate an additional of 10 pounds (4.5 kilograms) giving you a total of 30 pounds (13.5 kilograms) weight load. If there is one feature that stands out with this BCD, it is its inflation characteristics where the bladder inflates away from the body thereby preventing body constriction as what most old BCD does. Focusing on the regulator set of this package, it uses the Cressi MC5 1st stage regulator that has an overcompensation diaphragm, a semi-flexible elastomer sheath that protects it from the wear and tear of constant use and built on an ultralight material that only weighs 380 grams (0.8 pounds). 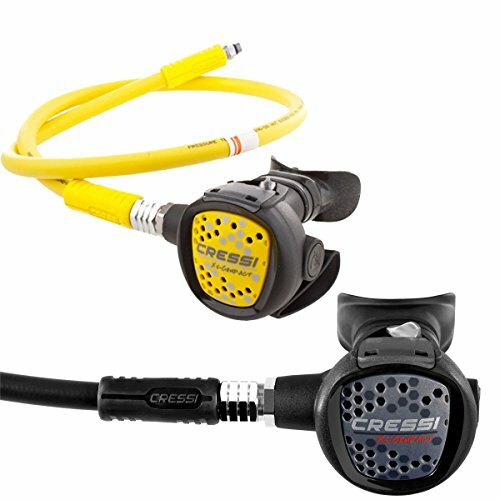 It uses the Cressi XS Compact 2nd stage regulator which features a downstream system, adjustable venturini valve for pre-dive airflow adjustment with an anti-friction lever, a large purge button and an anti-scratch surface. While both the 2nd stage and the alternate air source uses the same mechanism, the only thing that differentiates them is the color of the low pressure hose and the regulator itself where your 2nd stage is colored black while the alternate air source is colored yellow and has a longer low pressure hose. With regards to its console, it has a submersible pressure gauge that has a multi-color indicator mark where the units are expressed in bars (metric) rather than psi (imperial) and an integrated Leonardo C2 Console Dive Computer that is both air and nitrox compatible and can read up to 5,000 psi (345 bars). Since this regulator set already has electronic parts from the dive computer, extra care is required when use and must be properly stored in its provided Gear Up Guide Regulator Bag after rinsing and drying. This Scuba gear package also comes with its Akona Adventure Gear Roller Suitcase, that when you place the BCD and the regulator, only weighs a total of 15 pounds (6.8 kilograms). Just take note that while there are ample space inside the gear bag for other equipment like mask, snorkel and wetsuit, you have to be aware that long-sized fins may not fit in. If you try to compare this particular scuba gear package to the previously mentioned 15-pound Travelight gear version package, it will you give you an initial impression that the only difference is the absence of the gear bag. Well, that is quite obvious. But if you dig in to the details, you will realize that this is an upgraded version. The buoyancy compensator device in this package still uses the Cressi Travelight BCD that has weight integrated system that can carry up to 30 pounds (13.5 kilograms) of weight load and prevents body constriction as the bladder inflates away from the body. There is one more thing that we would like to emphasize with this BCD: while it can carry the whole weight of a human body, it further has an added lifting capacity that can reach a maximum of 36 pounds (16.3 kilograms). Its submersible pressure gauge is still the same with the 15-pound version package with the that is integrated in one console. By the way, this dive computer has the capability to read and record maximum depth, current depth, bottom time, decompression time / safety stop and surface interval or time before you can do your next dive. There are some questions raised whether the console has an underwater compass. This scuba gear does not have one, but if you like to have one, you can make a prior arrangement where the supplier can modify it into a 3 gauge console at an added cost. Now, speaking of storage protection, while it does not have the Gear Up Guide Regulator Bag as being included in the previous version package, it has its own . Examining now the regulator set, while it initially looks the same except for the color, you will realize that there is a big difference in terms of the mechanisms used. 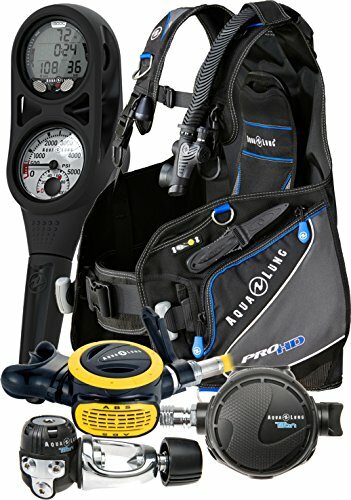 This scuba gear package uses the Cressi MC9 1st stage regulator which features an advanced air flow design, a special assistance chamber that keeps pressure drop to a minimum, an environmentally sealed diaphragm, self-lubricating jacket cylinder and is made from 316 stainless steel that has a total unit weight of 590 grams (1.3 pounds). Moreover, it has an additional low pressure port for low pressure hose attachment that goes to a drysuit. So if you are using one, do not forget to prepare an additional low pressure hose as it is not included in the package. You also have to remember that the 1st stage is pre-assembled with a yoke type of valve. So if you are using the DIN system, just make the necessary notification with the supplier and they will gladly refit it to according to your specification. As for the dive computer, it is separated from the console as compared to the integrated type from the previously mentioned scuba gear combo and is represented in this package through the . While it has a slim design, it features a large display for superior readability, a mineral glass display, manual gas switching and is Nitrox compatible from 21% to 99%. With regards to its storage bag, it comes with the that includes a large mesh bag and a small padded bag for the regulator set. The Mares Quantum BCD, Abyss 22 Regulator with Octo, Pro Plus Dive Computer Scuba Gear Package is one of the versatile choices you can have where it is designed for modification and adaptability. Starting with its BCD, the Mares Quantum BCD gives you the option to use a single tank or purchase add-on accessory for a twin tank capability. It is embedded with a monoplate backpack that has a tank strap that can be upgraded to a double strap for holding twin tanks. Its internal is composed of a classic air bladder, that when inflated, will gently wrap around your body which many claimed have provided them comfort and mobility at the surface, especially if you modify it to a twin tank capacity. It has an integrated weight system located in the front pockets that uses the “Slide and Lock System” and can be quickly dumped in an event of an emergency. Weight pouches at the back are also found which can be used for even distribution of the weights. With regards to the regulator set, it is composed of the Mares Abyss 22 1st stage regulator that features a vortex-assisted design with a dynamic flow control. It has been considered to be a high-performing regulator that can efficiently function regardless of water temperature and can also be used with enriched air as it is compatible with Nitrox with concentration reaching up to 40%. The Mares Abyss 2nd Stage and Octopus features a downstream valve encased in a nickel case that is covered in a chrome-plated brass and an ultrasoft mouthpiece that is made from hypoallergenic silicone. The console of this regulator set is a standalone gauge that only comes with the SEAC Submersible Pressure Gauge that has a 5,000 psi (345 bars) capacity and a 500 psi (34 bars) red mark indicator which tells you that you are low on air. The Cressi R1 BCD Leonardo Dive Computer AC2 Compact Regulator Set GupG Reg BagScuba Diving Package is one of the few scuba gear package that newbies can have especially if they decided to make scuba diving a serious sport. 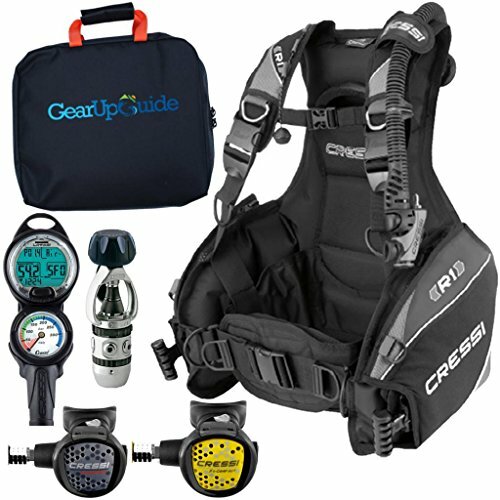 This package has the Cressi R1 Weight Integrated BCD that is designed for frequent and rugged use. It is generally made out of the highly durable 500-Denier Cordura that is internally coated with urethane and nylon. While the BCD has a rigid backpack, the hardness is compensated with pads on the back especially in the lumbar area. This BCD has one of the highest deflation rate courtesy from its pull-down dump valves located on the right side and the manual deflation from its inflator assembly. Its weight integration uses the Lock Aid Quick Release System located at the side where each pocket can carry up to 10 pounds (4.5 kilograms) each. On top of the weight pockets, there are two large zipped pockets on the side for accessory storage. Just make sure not to put the weights in this pocket as it may significantly damage the material. Aside from human weight, it has a lifting capacity up to 36 pounds (16.33 kilograms) where you can salvage and retrieve small objects by tying in its built-in light alloy D-rings. Talking about the regulator set, it has the Cressi AC2 Compact 1st Stage Regulator. This is non-balanced regulator that uses flow-by-piston technology and has a fail-safe design. While it may sound highly technical, it simply means that in the event the 1st stage regulator fails to function properly, it will still deliver high pressure air. All its components are made from marine grade chromed brass and still uses that classic conical filter that gives higher air flow. Flowing through the low pressure hose, air will be released out to the Cressi Compact 2nd Stage Regulator which features downstream demand valve mechanism with the flow of air channeled directly to the mouthpiece which creates a swirl or called as the Venturini Effect. It is made of a non-corrosive polymer that has a large yet soft purge button that allows you to easily clear any water entering inside the regulator. The console is made up of the Cressi Submersible Pressure Gauge and the Leonardo Dive Computer. While, at an initial glance, the submersible pressure gauge looks ordinary, but when used will reveal its amazing features. On an ordinary shallow dive, the dial markings are divided into 3 colors where we all know that the red mark indicates low on air at 500 psi (35 bars). But during deep dives, you will be surprised that the red marks automatically fades and extends its low on air mark to 1,300 psi (90 bars) which is good knowing that you have ample of air in ascending back to the surface. On the other end of the console is the Leonardo Dive Computer which is powered by a replaceable 3-volt battery that can operate up to 120 meters (393 feet) and electronically log 60 consecutive dives. The entire console is covered in an impact resistant rubber boot with multiple attachment points for clips and lanyards. Some, if not most of us, frequently goes to vacation and explore some of the World’s Best Scuba Diving Sites. These sites are scattered around the globe, some are in the tropics while some are located in temperate regions. In short, they do not have the same water condition and exploring them requires a specific kind of equipment. If this is the case, then the Cressi Aquaride Blue Pro BCD Scuba Gear Package is the perfect companion for the frequent traveller. This Scuba gear package is composed of the Cressi Aquaride Blue Pro BCD which is a multi-purpose buoyancy compensator device. The internal bladders can be compacted which is ideal for most tropical dive settings while it can expanded to accommodate weight and lift capacity which is the predominant case when you go ice-diving and wear a dry suit. In short, it is the BCD for all seasons. It is made out of 420-Denier nylon and a rugged trim making it durable enough for daily use. Some have claimed that even when they are diving on a daily basis, they do not feel the hardness of the backpack as it is totally padded with an added elastic chest strap for more comfort even when the BCD is fully inflated. This is also one of the few BCD’s in the market that features three dump valves scattered around the unit which you can have the option to select one if you wish to dump air regardless of your position at the surface. It has a weight integrated system that can carry up to 20 pounds (9 kilograms) of lead weight. 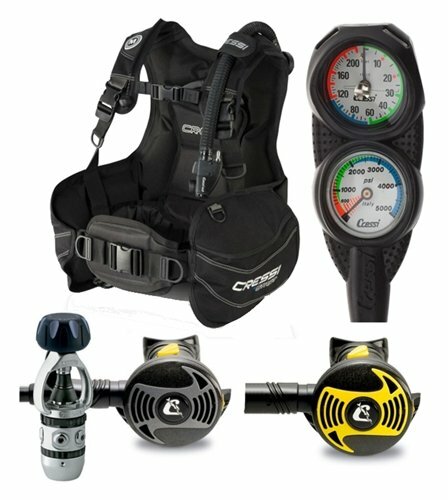 The regulator set of this scuba gear package is composed of the Cressi Compact MC9 1st stage regulator. It is a hyper-balanced diaphragm that has an anti-friction and anti-corrosion material which also allows the internal components to move freely inside its lightweight body cover that is further coated with a protective elasto-polymer shell. At the other end of the regulator set is the Cressi Compact 2nd Stage Regulator that is made of non-corrosive polymer. It features a pre-dive and dive adjustment function that compensates on the swirling Venturini Effect of Air that is gushing out of the regulator making it easy and comfortable to breath. The console of this scuba gear package has the Cressi Submersible Pressure Gauge and the Cressi Leonardo C2 Dive Computer. While the dive computer is integrated in the console, many have noticed the simple yet elegant design. Operating the dive computer would just mean making a single touch of the button and you can shift the program from air to nitrox mode, giving you enriched air capabilities if you want to. It is not necessary that all components of a scuba gear package will come from a single manufacturer. Recently, suppliers opt to combine different brands and models to answer the dynamic need of the growing population of scuba divers and the Divers Supply Scuba Package Special of the Month is one manifestation of this product combination. This package includes the Sea Elite Scout Weight Integrated BCD which is designed for quality, comfort and durability. It features an integrated weight system that is simple and easy to use. Aside from the weight pouches, it further has a zipped pockets on the side where you can place other dive accessories. Its sturdy backpack is fully padded with rear rubber for a strong tank grip. Many of its users has appreciated its tight fit and streamline structural design where it gives you very little resistance once you fin forward along the water. The regulator set of this package uses the Hog D3 Yoke 1st stage Regulator where it is acclaimed to be one of the best diaphragm regulator in the market. It has 2 high pressure ports and 5 low pressure ports which is perfect if you need additional ports, like the one needed for a drysuit. Unlike the stationary pressure ports of other regulators, this one features a 360 degree rotating swivel port where you can position your low pressure hoses in any angle you prefer. On the other end, it has the Hog Classic 2.0 LE 2nd stage regulator which is a new product derived from the Zenith line of regulators. This is a limited edition and only 500 units are sold in the market. It features a redesigned exhaust valve port cover which minimizes flutter or fold especially in events of strong water current making this the ideal regulator for drift diving. This particular feature also prevents wet breathing which is experienced in some regulators. This regulator set has the EDGE Escape Octopus which features a pre dive/dive selector that allows you for a quick and easy tuning of the regulator for maximum air flow. This alternate air source is made from lightweight high impact case with a plastic air barrel and highly visible yellow-colored low pressure hose that is braided in a 40 inch nylon webbing. 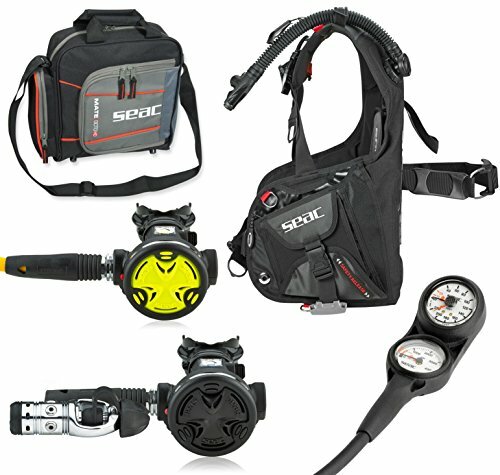 With regards to the console and dive computer, this scuba gear package gives you 2 choices. Your first choice is the Sea Elite submersible pressure and depth gauge that comes with Mares Puck Pro or Mares Puck Pro Plus Dive Computer. While this set-up perfectly describes what equipment redundancy is, you can proceed with your second choice which is an upgrade to this package, where, instead of of having a submersible pressure and a wrist type computer, you can have the Suunto Cobra Console Computer which many have considered it a high-end piece. 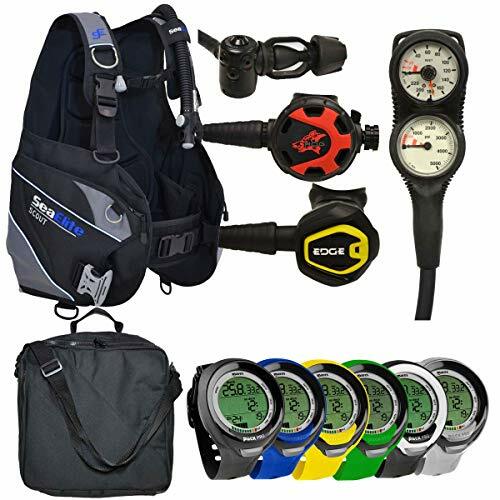 The SEAC Smart BCD Scuba Regulator Dive Gear Package is one of the few scuba gear packages that features the simplest components possible, but instead, geared towards frequency of use and durability. It has the Seac Smart BCD which is a tough jacket style buoyancy compensator device with an integrated weight pouch that is fitted with a safety gravity release system. It has a double bladder where the inner bladder is made from polyurethane coated Cordura 500 while the outer bladder has a tougher Cordura 1000 material. Many have appreciated the easy positioning of this BCD at surface where you can easily descend immediately courtesy of its 3 dump valves located at the shoulder, back and within the inflator system itself. The regulator set is composed of the Seac P-Synchro 1st and 2nd Stage Regulator that has yoke valve, Seac Synchro Octopus alternate air source with a yellow-colored low pressure hose and the Seac Analog 2 Gauge Console that has a 5,000 psi (345 bars) reading capacity and depth gauge with index marks up to 260 feet (79 meters). While having an initial glance at the SEAC submersible pressure gauge, it will give you an impression that this is just an ordinary air measuring instrument. But we tell you, looks can be deceiving. Simple and ordinary it is, but this SPG is one of the few old-school instrument that is designed for use with enriched air where it is compatible with Nitrox with a concentration up to 40%. During off season, you can either hang the regulator set or store it in its provided SEAC Padded Regulator Bag that is fully padded and has a carry handle and heavy duty zipping mechanism. The only downside of this regulator set is that it only has 1 high pressure port where many have conceived it to be a disadvantage if you want to use multiple SPG’s to read your tank’s remaining air. But come to think of it, most of us only use one SPG and having two instruments may just complicate matters with little or benefits. Its like wearing two watches at the same time. Aqualung makes great products that last and this is a perfect Scuba Dive Gear Package. The Jacket style BCD has a wrap around bladder for under the arms and back to give you full buoyancy when you need it or don’t with an easy to use inflator/deflator release buttons. There is a weight integration to get you down in the water with an easy in and out attachments. The regulator is comfortable and easy to hold in mouth and is a bright yellow for easy seeing! The i300 computer is top of the line and incorporates air and nitrox modes for the technically advanced divers but easy enough that a beginner could use it with no issues. From salt to freshwater and learning in the pool it will withstand all of the elements and just make sure you give it a quick rinse after every use to keep it looking good as new. It comes with a regulator bag for safe keeping and works great in cold or warm water! A very solid dive package with all of the bells and whistles especially if you have just started and wanted to progress to all of the more intricate. Of course more Cressi packages with more options! The is a great deal for the more advanced diver with more functions and features. The full face mask is the high seller along with all of the console, etc… that I will get into in a moment. The mask is a full face that seal tightly with high grade molded silicone rubber so it has a smoother comfortable seal that won’t leak you. There is an adjustable flow control knob and an integrated 2nd stage regulator. It really is fantastic and for those who do not like the mouth regulator this is a great option to keep you safe and comfortable under water. It comes with the Leonardo Air/Nitrox C computer console which gives you more options than you could imagine when you are diving. Integrated with online saving options so you can track all of your dives. Click here to get more info from another article comparing different computer consoles so you find the right fit for yourself. The BCD has R1 integrated weights for more options when you dive in no wet suit to a dry suit to get you down faster. Adjustable buckles on both shoulders with easy clips for on and off. Chest and abdomen buckles with an extra pad for your stomach. There are clips built in for carabiners and to attach your knife, flashlight or flashcards if you are a divemaster and beyond. What does BCD stand for in scuba diving? BCD’s are buoyancy control devices and they allow you to have buoyancy in the water. They will allow you to descend and ascend in the water at a controlled rate. Two different BCD’s you can get are the jacket style and the wing style. If you are new to diving or are more recreational this will be the jacket you will most likely be wearing. You have the harness and air bladder in a single unit for simplicity and the bladder will be in the abdomen and at your back and shoulders. This gives you an even balance of air so you can control your buoyancy better. A wing style first of all can accommodate two tanks instead of one. The wing style also has a the bladder at the back and can make balance easier once you get used to it (only takes a few dives). It can be heavier with the backplate set up so travelling can make this more difficult but if you are a commercial diver or live somewhere where you own your own gear this is a great option as well. 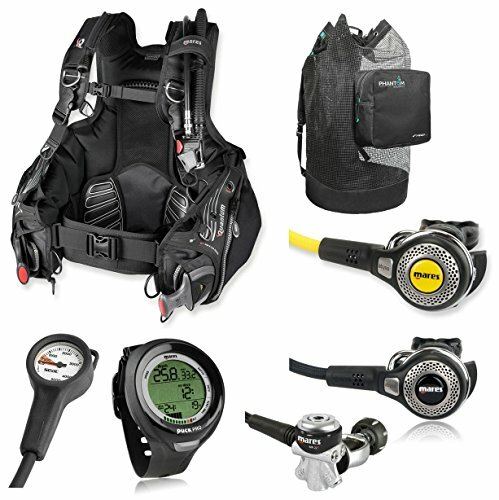 There are lots of packages to choose from with lots of BCD's, regulators, hoses, dive computers and so much more. When deciding on how to buy a scuba package, the important bit is to remember what you will be using it for. If you dive a few times a week or daily for the matter you will want something with all the bells and whistles that are durable. If you like basic, light equipment stick with that, DO NOT try to sell yourself on I might use this or I might want this. Enjoy your next dive trip and make sure to check our destination article for best diving in Kauai.